As a fitting finale to the Scientology Congresses, L. Ron Hubbard’s last came right from the topmost level. It was the breakthrough that would lead to the development of the Clearing Course, the Grade Chart and the Organizing Board. It was a discovery that embracive, that basic—because it is Basic Purpose. As he reveals, “Every engram we have explored, every piece of black mass, every ridge, every white-burning fire, every everything that went on in the mind comes about because of a change or alteration in a person’s Basic Purpose.” And that’s just the beginning of what Mr. Hubbard discovered, for when you hear his lecture, Basic Purpose, you’ll have a whole new understanding of what “Know Thyself” really means. Yet beyond all this discovery was generating, in terms of faster clearing in greater numbers, there’s another reason this was called the Clearing Success Congress. For if you’ve ever wondered how it all fits together—the technology, the organizations, the combined force of Scientologists, the answers are all here. From the landmark lecture on the pivotal role of Scientology Organizations in driving planetary clearing, Your Scientology Orgs and What They Do for You, to his exact program on how to make it a reality—World Clearing and You. 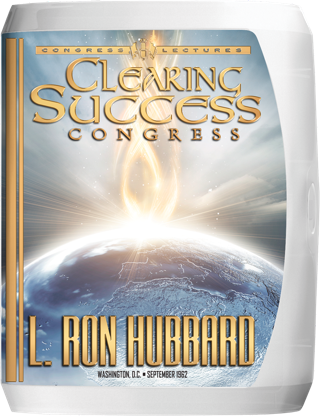 Here, then, is L. Ron Hubbard’s final Congress and the road map to a Cleared Planet. As a fitting finale to the Scientology Congresses, L. Ron Hubbard’s last came right from the topmost level. And with precision processes and exact procedures founded on just that principle, he was shattering cases and intensively instructing Saint Hill Special Briefing Course students in the particulars. Yet however miraculous that technology, with a planetary population in the billions, World Clearing by “two auditing chairs apiece simultaneously” would require the next trillion years. Something else was needed. And therein lies the greater story of what Mr. Hubbard’s discovery of basic purpose then generated in terms of doingness. Although still ongoing, the Briefing Course had already encompassed 209 lectures. Moreover, he had not only raised auditor expertise to undreamed-­of levels, he’d developed new training methods which could now be employed in every organization for their own zones of training. So it was Mr. Hubbard boarded the Queen Elizabeth destined for New York en route to Washington, DC. While as for the particulars, the site was the Mayflower Hotel and, fittingly, the largest attendance ever. And while many a previous Congress had seen its own theatrics, this one even included an offer to find the Goal of someone—name drawn at random—by Congress end. All of which explained the intensive auditing between lectures—because, yes, they did indeed find that goal. And finally, as for the atmosphere of excitement, a dramatic demonstration of a GPM not to mention the live drums of old­timer Louie Belucci—during the lectures! But if it all had an air of celebration, there was good reason. For here was the critical importance of revitalizing an individual, a group or a planet, and in this way setting whole nations on the Road to Freedom. He reduced down those purposes and counter­purposes to their core—the Clearing Course—so that today one need only follow his map. Then again, he completed development and release of the Bridge—The Classification and Gradation Chart of Levels and Certificates—and there it is, at Clear: Purpose. And, finally, he aligned all purposes. For, concurrent with his development and release of the Grade Chart for personal freedom, he also developed and released the Organizing Board as the Third Dynamic chart to carry it forward. And, in this final Congress, he told us how to do just that.